Why would I need self storage in Dover, NJ? There are a variety of reasons why you might need self-storage in Dover, NJ. How much is a storage unit in Dover, NJ? The cheapest storage unit in Dover, NJ is $58.00 per month. What size storage units do you have available in Dover, NJ? In Dover, NJ we have sizes that range from 5'x5' to 10'x30' to suit your storage needs. How much is it for a 5'x5' storage unit in Dover, NJ? The cheapest 5'x5' storage unit in Dover, NJ is $58.00 per month. Dover is a midsize town located on New Jersey's Rockaway River, just over 30 miles from New York City. It's home to a very diverse population, with a growing Hispanic community calling the town home. Dover has a fairly small geographical footprint at less than 3 square miles, but it packs plenty of amenities into its boundaries. In 1713, Joseph Latham received a large portion of land in western New Jersey as part of a land deed. He then passed on 500 acres to John Jackson, who developed one of the first settlements on the land that would eventually become Dover. The area was known for its plentiful supply of iron ore, which could be picked directly off the ground at Dickerson Mine at the nearby Mine Hill. A forge was established to process the ore into bars, which were transported to many of the East Coast's flourishing industrial centers. However, when the British passed the Iron Act, it created many challenges for the industry. John Jackson's financial success crumbled, and he was focused to declare bankruptcy. The land was purchased by Hartshorne Fitz Randolph, eventually becoming part of Randolph Township. In 1869, Dover was incorporated as a town, considered part of Randolph Township. By 1896, the town had become an independent entity, reincorporating as a city. However, after the passing of a city referendum, Dover returned to town status in 1899. 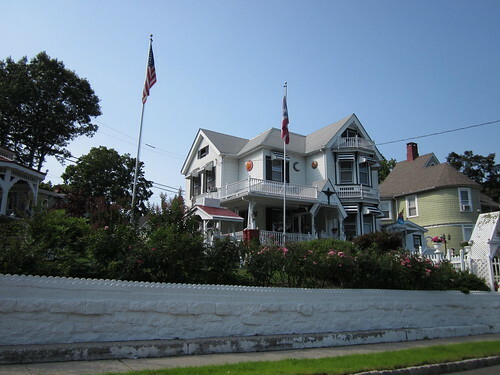 Dover retains a quaint feel despite its easy access to larger metropolitan areas, due mainly to the pre-World War II architecture that gives the town historical appeal. Popular local attractions include the Baroque Orchestra of New Jersey and the Community Children's Museum. The Blackwell Street Historic District is a particular highlight of Dover. Considered one of the most important industrial towns in Morris County, this area has buildings that span 100 years of American architecture. The streets date back to 1812, when the village had just 12 homes and an iron works. Dover is also home to many parks and recreation areas. JFK Park hosts several community events, including the annual Christmas tree lighting, the Easter egg hunt and the summer concert series. Dover Public School District oversees the public schools of Dover and a few neighboring communities. Dover is also home to a unique post-secondary school, The Joe Kubert School of Cartoon and Graphic Art. Founded in the 1970s, it's the only accredited cartooning and graphic arts school in the country. Utilities: Jersey Central Power & Light, New Jersey Natural Gas and the town utilities board are the primary energy providers in Dover. Garbage and Recycling: Trash is collected twice weekly, and you also have the option of participating in curbside collection of recyclables. Transportation: Dover receives public transit service from a few agencies, including the New Jersey Transit bus network, Lakeland Bus Lines and the Morris County Department of Transportation. Considering its proximity to New York City, one of the most expensive housing markets in the country, Dover has a surprisingly affordable housing market. Prices are far below what you would expect to pay in many of the Big Apple's neighboring suburbs, which has added to Dover's attractiveness as a commuter suburb. Our lowest priced units in Dover, NJ average $58.00 per month. 45 people have reserved units in Dover, NJ in the past 30 days. There is 1 location within Dover, NJ's city limits. There is 1 location in Dover, NJ that offers AC and Heating features.